Christmas appetizers can be great for getting a party mood started during the holiday season. You get the people ready for the actual Christmas dinner and you will surely be a hit with the two Christmas appetizers that we recommend below. Top everything up with carefully chosen Christmas desserts and your Christmas party will surely be a hit from a culinary point of view. The best thing about this recipe is that the guests will surely believe that you spent a lot of time in preparing the appetizers. We and you will know that this is not the case. Take a large skillet. Use it to cook the butter, onions, vinegar and brown sugar. The heat source should be medium to low. When the onions turn to golden brown, you can remove. Cool everything to the room temperature. Use a floured surface and roll the puff pastry in rectangles of 11 X 8 inches. Spread the Brie over the pastry and cover with onions. Sprinkle caraway seeds. Take one side and roll it to the dough’s middle. Then take the other side and do the same. Use a knife (serrated) and cut into slices of half an inch. Place all on a baking sheet lined with parchment paper. Flat all to a quarter of an inch and then refrigerate for a quarter of an hour. Take a small bowl. Beat the water and the egg. Brush this to the slices. Then, bake everything at around 375 degrees Fahrenheit for 12 minutes. You know that all is done when the result is golden brown and puffed. The appetizers should be served warm. These tartlets should be served warm and you can sprinkle fresh herbs that are chopped on top for the appetizers to look great. Take the pastry and then cut it into 6 pieces that are equal. Take them one by one and roll in rectangles that measure 9 X 6 inches. Every rectangle should be cut into 6 3 inches squares. The result is 36 squares. Preheat your oven t 425 degrees Fahrenheit and dampen baking sheets so that you can add them on pastry squares. Take the pastry squares and put them on baking sheets. Make sure that you leave space between them. Then, divide pepper slices and the Parmesan between 12 squares. Top 12 more with goats’ cheese and tomato slices. The last 12 should be topped with mozzarella and prosciutto. Bake everything in the oven till your pastry is golden brown and puffed. This should take around 15 minute tops. 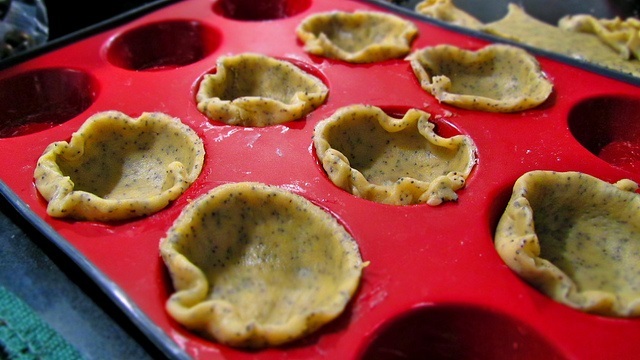 Serve your tartlets warm and sprinkled with the chosen herbs.